Lucky has been with MaPaw for about a year and a half. She is now 13 and looks like a peanut compared to some of the big dogs on the farm. She’s a bit of a loner and likes to have her safe zone (which happens to be the bathroom upstairs with a nice comfy bed and hidden stash of treats just for her). She has made great strides interacting with people and the visitors to the farm have certainly helped her. Lucky is a special girl, but she is getting older and weaker. 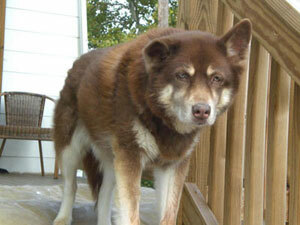 We’ve decided that it is time to remove Lucky from “available” status into our Husky Hospice program. Husky Hospice is for those pups who need a quiet space, a warm bed, good food, kind words and lots of hugs and kisses to fill the time they have left. We like to think of it as our final gift to them for giving their unconditional love and devotion. Lucky will live out her days on the farm where she is comfortable and knows she is safe and loved.